Almost immediately following my first post about Princess Dice I received tremendous responses. I have @FatherGeek to thank for re-tweeting my links, but I received much more response from the BoardGameGeek community. Thank you everyone for your comments and enthusiasm! Apparently, this is something that many people would love to have. A game made for girls, playable by gamers and family alike. One thing I have learned through past design efforts is how much momentum I gain from discussion and feedback. I had planned on writing updates for the Dead End project this week, but the excitement is high for Princess Dice and I cannot ignore this. I’m honestly a bit jealous that I don’t have that nice of a set yet. My dice and labels are on order and my girls are excited. I showed them Jamie’s picture and they just couldn’t understand why he had the game already and we only had a cruddy black and white version. Grrrrrr. Anyways, development continues. Thanks to the feedback I’ve been receiving I can say that this is the quickest evolving design I have ever created. We are at day 4 and already have a complete rules set drawn up, a working score sheet, and all the required art. I hope to be able to keep this pace up until I’m satisfied that it is done. As it stands right now, the game is very playable by children. It seems to be lacking a bit of fluff that could make it more interesting for gamers, but that’s not a bad thing. I am heavily considering adding a bit more chaos to the mix. That will have to be determined in playtesting. Speaking of playtesting, I’ve put the rules up here. 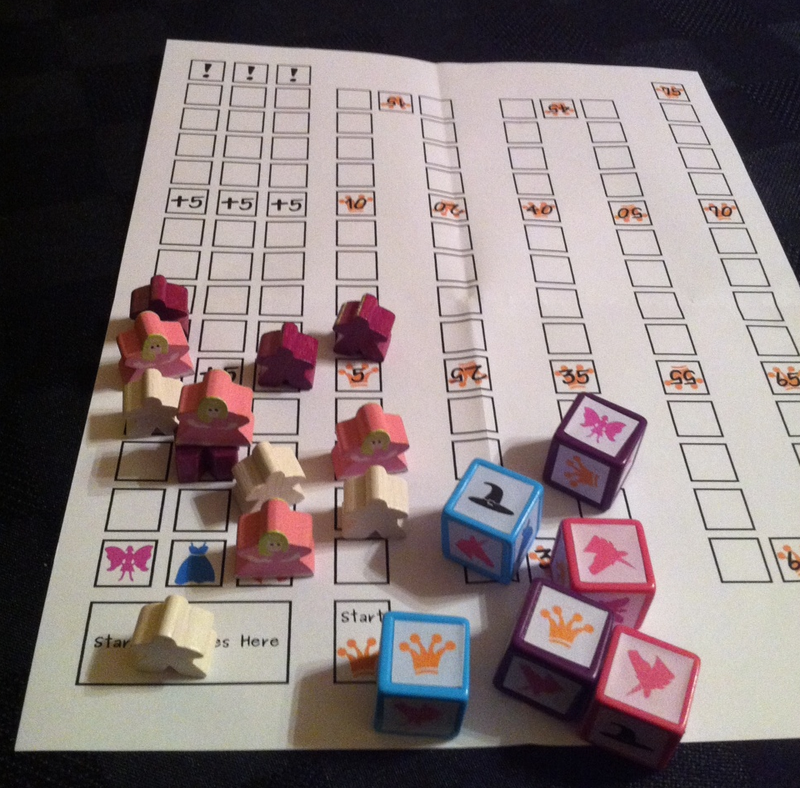 I’m not ready to publicly share the rest of the stuff, but if you are interested in making your own set and playing the game, please feel free to email me and I’ll get you set up. Keep the momentum rolling by re-sharing on Twitter, Facebook or whatever. There’s little buttons below just for that!